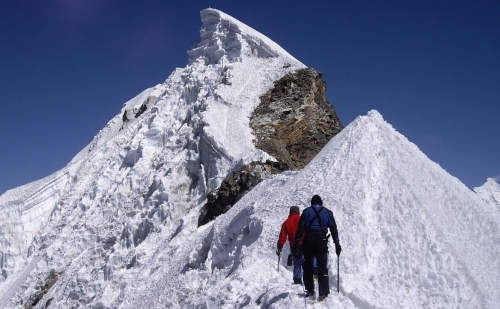 Mera Peak is one of the popular climbing trekking peaks in Nepal. 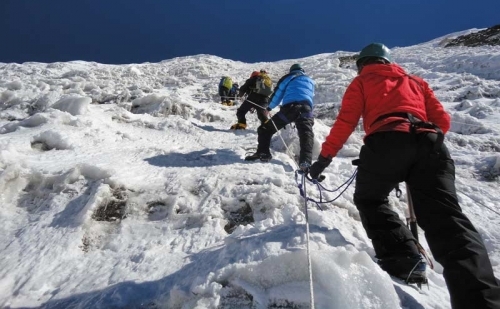 Mera Peak Climbing an exciting and adventurous journey to scale the highest peak permitted for climbing in Nepal takes you to the south of Everest, at the edge of Khumbu region. 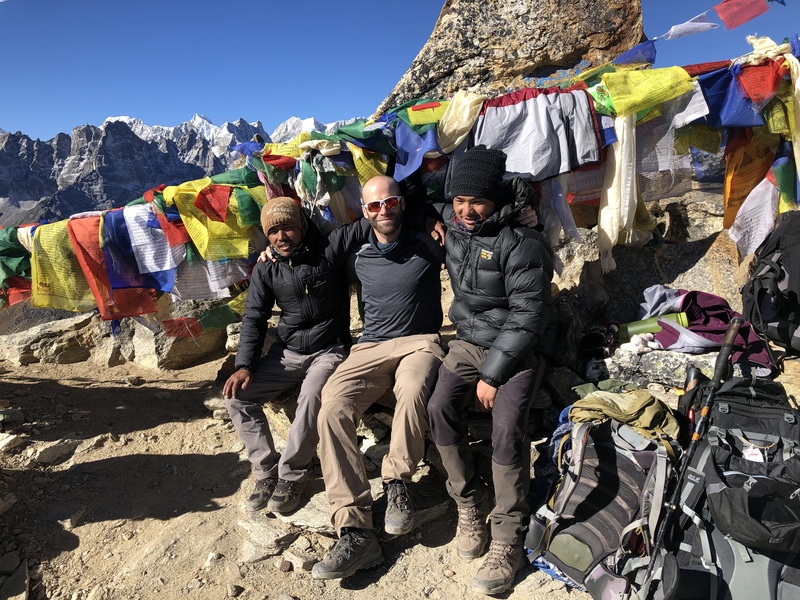 Mera Peak was first summited by Jimmy Roberts and Sen Tensing in 1953 and is preferred by trekkers who want to experience snow hiking and climbing. The trail passes through Sherpa settlements in the Khumbu region, where grazing yaks and cooking on fire from yak dung is common. The Mera Peak Climbing trip begins after an early morning flight to Lukla (2800m) from where we walk to Chhutenga and stay overnight. In the subsequent days, the slow gain in elevation as we move through Khothey, Tagnak, and Khare helps us acclimatize as well. Crossing the Mera La pass we reach the Mera Peak Base Camp and ascend further to the High Camp (5750m). Mera Peak (6654m) itself is technically an easy climb and the slopes seldom exceed 40 degrees, however, crevasses at places demand alertness. The Mear Peak Climb could be challenging after a fresh snowfall. 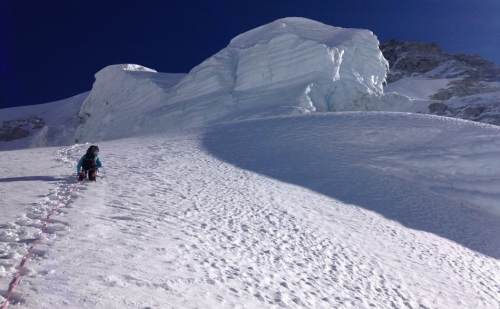 The classic snow ridge that guides us to a steep slope takes a strenuous 50 meters ascent before reaching the top. 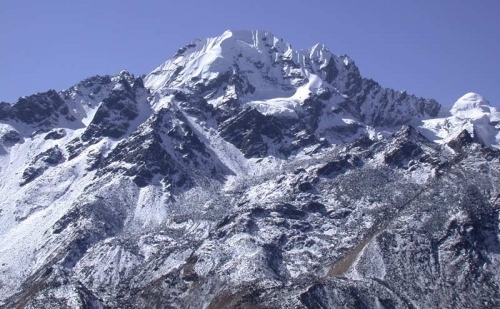 The panorama formed by Everest, Kanchenjunga, Lhotse, Makalu and other peaks is magnificent and rewarding to the climb. We take the same route back to Khare and return to Lukla, the starting point of our trek. Mera has three summits among which we climb the highest one. The trek itself is physically demanding due to high altitude gain, however, Mera Peak is an easy endeavor. Gradual ascent through beautiful valleys and rural Sherpa communities aids acclimatization and makes for a pleasurable journey. Views of the 8000m peaks Everest, Cho-oyo, Lhotse, Makalu and Kanchenjunga including several other peaks are outstanding from Mera La onwards. Day 14 :Trek from Kothe to Zatrabok which takes about six hours. Day 15 :Trek from Zatrabok to Chutanga and it takes approximately five hours. Day 16 :Trek from Chutanga to Lukla and it takes about four hours. Pick up and drop from Kathmandu airport to airport. 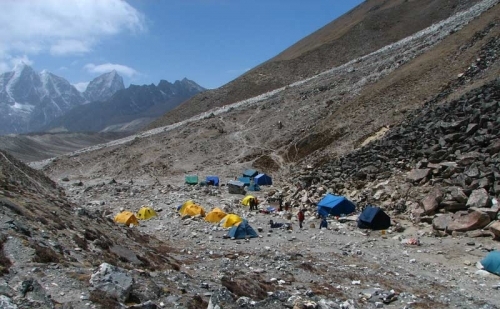 High altitude food and all climbing crew will be available above base camp. Icefall fees Garbage Deposit (Sharing with other members) if applicable. Wake talkies & Filming permit. Day 1 :Arrival in Kathmandu (1300m. )Arrival in Kathmandu. Our Airport Representative will meet you at the Tribhuwan International Airport. A drop to the Hotel by private tourist vehicle is arranged. You can either take a rest or meet us at our office and know the detail arrangement of the Trek. Overnight stay at the hotel. Day 2 :Free Day in Kathmandu & trek preparationAfter breakfast, you will be introduced with the trek leader/guide at the hotel. This pre-trip meeting is for briefings on the trek and other necessary details. Please bring along your passport and three passport sized photos and a copy of your travel insurance policy. You can use your free time to rest or explore around for some last minute shopping. Day 3 :Fly to Lukla (2800m.) and Trek to Chhutenga (3450m. )We start the day with an early morning flight to Lukla via the domestic airport. It’s a scenic flight of around 35 minutes in a small airplane. After landing in the Tenzing-Hillary airport, we meet the rest of the team and get briefings on the journey further ahead. The trek to Chutanga marks the beginning of the journey. It’s a 3-4 hours walk through pine and rhododendron forests to the campsite. Day 4 :Trek to Khark Tang (3750m. )The trail continues through oak and rhododendron forests that makes up for a pleasant walk. After a slight ascent to a small stream, the steep increases and continues for about two hours to reach Khark Tang. Day 5 :Trek to Chhetra Thu (4350m. )As we move ahead ascending along the trail to Chhetra La, views become clearer and from the top, Cho Oyo stands beautiful along with other peaks. A straight trail continues for about half an hour which then takes a downhill for about an hour to reach Chhetra Thu where we stay overnight. Day 6 :Trek to Khothey (3600m. )The walk continues on leveled trail for about an hour to reach a viewpoint where Mera peak’s beautiful view can be observed. Then, through oak and juniper forests, we descend for about two hours, passing through Thakthor and Kote, two small settlement areas. The trail further continues along small hills to reach Khothey where we stay overnight. Day 7 :Trek to Thangnak (4350m. )Passing Kharkas or grazing fields of Gondishung, we head to the small monastery beneath an overhanging rock formation. Ahead, the valley narrows as we move close to the western peak of Mera. After walking for about five hours, we reach Thangnak where we stay for the night. Day 8 :Rest day in Thangnak (4350m. )Acclimatization at Thangnak is essential as the gain in altitude demands some time for the body to adjust. We climb to the glacier (5000m) in the morning hours, where rear views of Mera peak are spectacular. After getting back and taking our lunch, we may as well venture to Sabai Tsho, a glacial lake. Day 9 :Trek to Khare (4900m. )The trek to Khare takes about 5-6 hours from Thangnak. The trail gets steep and bends along the valley to pass along the moraine of the Dig glacier to reach Dig Kharka. 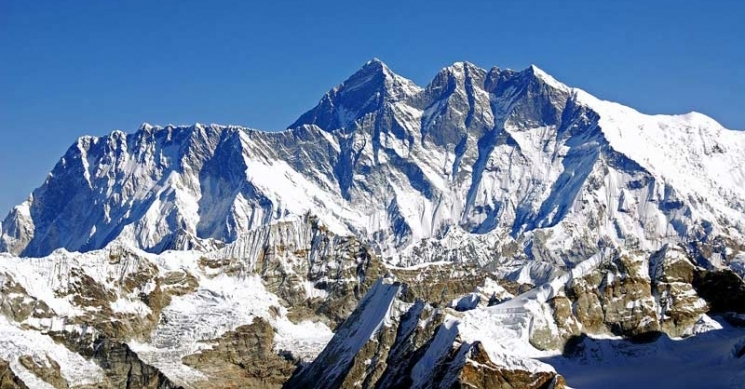 Spectacular views of Charpati Himal and other peaks including the Peak 35 which has not been scaled yet can be viewed. We ascend along the last section of the trail to reach the base camp at Khare where we stay overnight in a tea house. Day 10 :Trek to Mera peak Base Camp (5350m. 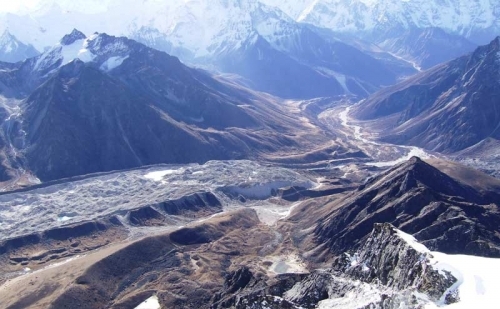 )The walk today is a short one, which starts with a gradual ascent to the Mera glacier. It’s steep in the beginning but eases out as you move higher to reach a long flat trail leading to the Mera La (5400m). A short descent leads to the Mera base camp where we camp and rest for the day. Day 11 :High Camp (5750m. 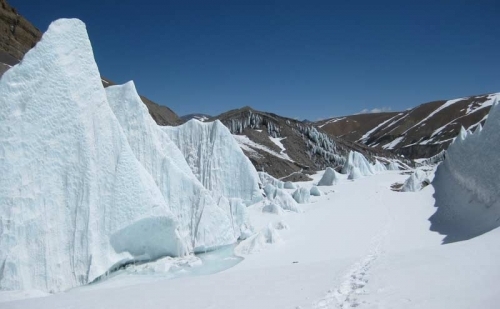 )We ascent to the Mera High Camp along flat trails atop the glaciers. Views are outstanding from here. We set our tent and prepare for the next day’s ascent. Overnight stay in a tented camp. Day 12 :Summit (6654m.) and back to KhareOur journey begins early today. We wake up at 1 am and prepare for the climb. After breakfast, we start the journey which is a slow climb. At around 2 am, we head for the summit, as its best to return back before afternoon. 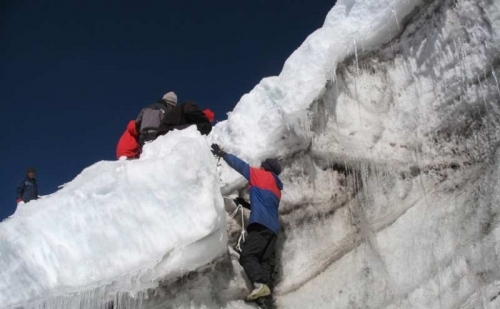 It’s an easy climb though the final ascent requires ice axe, crampons and ropes. 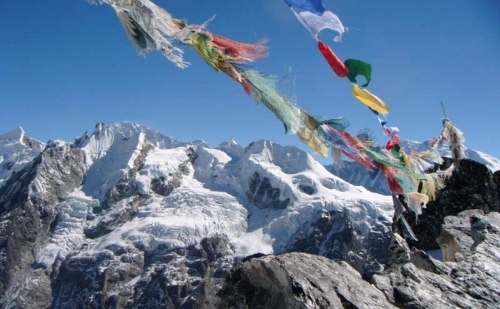 As we climb, magnificent sunrise views of Kanchenjunga, Everest and Makalu can be viewed. The summit is a fantastic viewpoint with Everest, Cho Oyo, Lhotse, Makalu and many other peaks ready to be photographed. We then head back through the same route all the way to Khare where we stay overnight. Day 13 :Trek to Khothey We move back the same route through Thangnak to Khothey. As we are descending, the walk is quite relaxing. Day 14 :Trek from Kothe to Zatrabok which takes about six hours.The trail goes steeply up all the way to Zatrabok. On the way you pass forests and green hills. Day 15 :Trek from Zatrabok to Chutanga and it takes approximately five hours.Till Zatrawala Pass the trail is ascending and then your trek begins to descend until you reach Chutanga. This route is a rocky path. Day 16 :Trek from Chutanga to Lukla and it takes about four hours.You trek through forests of fir, rhododendron, oak, juniper and local vegetation. The trail you walk along moves downhill all the way to Lukla. You can enjoy the views of Numbur Himal, Kongdi Ri, Karyolang peak and many other mountains and peaks. Day 17 :Fly Back to KathmanduThis is the day when Mountain flight from Lukla to Kathmandu is enjoyed over once again. On reaching Kathmandu it is time to enjoy shopping and walking round the city. The evening is to celebrate for successfully completion of the trip. Day 18 :Departure or onward for next program A drop from the hotel to the airport 3 hours before the scheduled time of flight is arranged in a private tourist vehicle. You can also extend your trip by opting for another program.